Unique Ductless Needs to Be Aware of | AllTech Services, Inc.
It’s Time: Make That End-of-Season AC Repair Call Now! Are Your Pipes Prepared for Winter Weather? When it comes to choosing the right cooling (and heating) system for your home, there are a number of factors to consider. You’ll want to look at the size of your home, your budgetary needs, how efficient the HVAC system is, and more. Our staff is here to help you make an educated decision in the manner. One system we frequently recommend to our clients is the ductless system, and for good reason! Operating on heat pump technology, a ductless system can effectively cool your home in the summer while just as effectively heating it in the winter. This makes them a great choice for homeowners looking to replace both systems, install a new air conditioner altogether, or homeowners who just don’t want to deal with the indoor air quality and efficiency loss issues that ductwork can bring. But they aren’t right for every home, and it is important to be aware of some of the repair needs you can run into if your system is not professionally installed or serviced, which we’ve highlighted below. 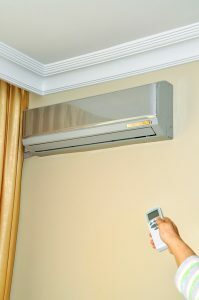 Each of the wall-mounted air handlers is connected to the outdoor unit of the ductless system by a conduit that contains the refrigerant line, power line, and condensate line. This last one is what removes water moisture from the cooling process so that moisture doesn’t enter your home. However, these lines can leak, and if that occurs, water starts to collect between the back of the air handler and the wall. If this isn’t caught fast enough, the wall material will start to weaken, and the air handler can rip away and fall off, damaging the wall and almost certainly breaking the air handler. Therefore, if you see any signs of water damage surrounding your air handlers, it’s time to give our pros a call for potential ductless repairs. There is a benefit associated with this repair need. This is because if a single air handler breaks or is malfunctioning, whether due to a failed motor or some other issues, the rest of the air handlers throughout your home will still continue to operate. The only portion of your living space that loses conditioned air in this case is the room with the broken air handler. You should call for repairs as soon as you can when you have a problem, but rest assured that if you wait on this repair, you can still get adequate cooling or heating in other sections of your home. This problem is not unique to ductless systems—it can happen to any type of air conditioner—but it may be more harmful in a ductless system since refrigerant has the ability to leak behind your air handlers and expose your home to potential harmful fumes. If you had your ductless system professionally installed and have kept up on its maintenance (twice a year) then you don’t need to worry about this problem. But regardless, if you notice something such as a drop in cooling power, or a frozen evaporator, then it may be due to refrigerant loss. This loss must be accurately located and repaired so you don’t lose any more AC functionality. For Ashburn, VA HVAC services you can rely on, contact AllTech Services, Inc. today. © 2016–2019 AllTech Services, Inc.. All rights reserved.